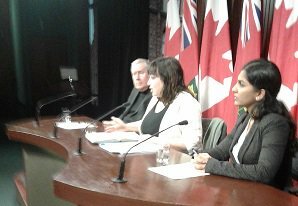 Toronto – Academic leaders, democracy advocates, patient advocates, front-line care workers and doctors are all speaking with one voice when it comes to the leaked health care omnibus bill that has secretly been planned by the Ford government for months: if passed, it would cause health care chaos that will last for years. Speaking at a Queen’s Park press conference this morning, representatives called on the Ford government to rethink their plans; to rebuild capacity in our public health care to meet population need and consult with Ontarians in a proper and meaningful democratic consultation process about the future of our health care system, rather than engaging in massive restructuring and privatization. The leaked omnibus health care bill creates a new “Super Agency” by merging 14 Local Health Integration Networks, Cancer Care Ontario, Health Quality Ontario. It also gives new extraordinary powers to the Minister and the Super Agency to privatize significant portions of health care and to facilitate the mega-mergers of health care providers such as hospitals, long-term care homes, home care, clinics and so on. The legislation drops public interest protections from the previous LHIN legislation including requirements for open board meetings, appeals of restructuring decisions, principles to guide decision making, equity, a requirement to plan to meet population need for health care and others. It has vast scope and far-reaching consequences. Put in context, the leaked legislation impacts millions of patients; hundreds of thousands of doctors, nurses, health professionals and support care workers; the entire cancer care system; 262 local hospitals; 629 long-term care homes; all of home care; more than 1,000 clinics; Ontario’s organ donation system; our quality tracking system, and more. Because the plan is to create a market for privatization, according to the leaked omnibus bill, the government will tender services, inviting public non-profit and for-profit companies and health care entities to apply to merge or take over other services. In one part of the province we might see for-profit long-term care homes take over public convalescent care or chronic care, in another, a large hospital may try to take over home care, in another multiple hospitals could merge in mega-mergers including for-profit hospitals or clinics. In addition, the Super Agency can order the privatization of any part of the supply chain or “procurement” (undefined and therefore not limited) and decide what company takes over the services. “What is planned is not seamless integration. It is disintegration and a patchwork quilt of inconsistent services”, warned Hugh Armstrong, professor emeritus from Carleton University. “There is no question that this legislation gives access to public non-profit hospital, home care and a range of vital support services for private for-profit companies that they have never had before. It is a prescription for privatization that will undoubtedly compromise quality, safety and lead to two-tier health care,” reported Ms. Mehra. The legislation and the leaked internal Ministry of Health documents show that the Ford government has been planning this legislation for months behind the scenes, but has not told anything to the people of Ontario. Normally major policy changes are preceded by a discussion paper or “white paper”, which is sent out for broad public consultation before legislation is even written. Once the legislation is introduced in the legislature, it goes for public hearings across the province and amended as a result of the public input received. In this case, there has been no discussion paper, no public consultation, and the documents reveal that the government planned to introduce the legislation and put out services to tender within a few short weeks before the legislation would even be proclaimed and without any allowance for meaningful public input. Last week, the Ford government responded by misleading denials and tactics designed to put themselves on the offensive rather than the defensive. Health Minister Christine Elliott claimed that she had never seen “the leaked document that the NDP revealed today”, on the day of her press conference. She claimed that the legislation was drafted by the non-partisan civil service as though it was just an idea generated independently and her government had nothing to do with it. However, she neglected to mention that Premier Doug Ford’s Cabinet (that is every Minister in government including Minister Christine Elliott) passed the direction for the legislation. She did not admit that her own signature is on the Orders In Council (Cabinet documents) to create the Super Agency and begin appointments. She also failed to note that the documents show that the government intended to introduce the legislation this month and that the tenders for the first restructuring/privatization were scheduled to go out in March. It is not possible that the Health Minister would not be intimately involved at this late stage of the planning. Mr. Ford called in the OPP to hunt for and fire the person who leaked the document. But without that person and the NDP’s intervention, Ontarians would have been in the dark about the government’s intentions for potentially the largest scale restructuring and privatization of health care that Ontario has ever seen until it was too late for them to effect any change. For more information: Natalie Mehra, executive director Ontario Health Coalition 416-230-6402 (cell); Michael Hurley, president OCHU/CUPE 416-884-0770 (cell); Katie Arnup, executive director Canadian Doctors for Medicare 647-289-5205 (cell); Duff Conacher, co-founder Democracy Watch (avail until 2:30 p.m.) 416-546-3443 (cell).